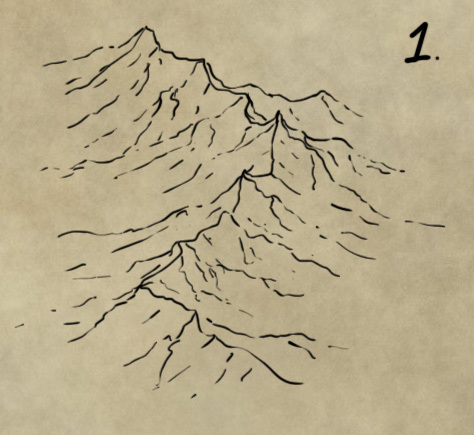 Here’s a quick walkthrough of the four steps I take in my mountain ranges. 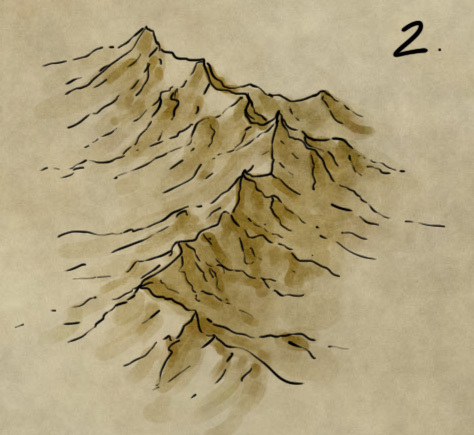 First off – we always need some solid line art to underpin our mountain range. 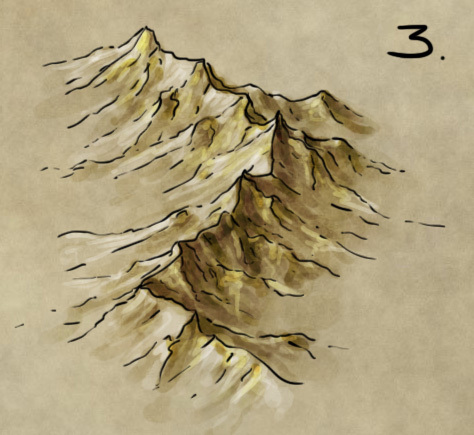 Here’s the tutorial on the steps I take when I draw up a new mountain range. Note that here I’m using a mid tone textured background. You can either create your own, or grab this one from here. Here I’m taking light to be coming from the top left – so the right hand side of the mountain range is in shade. I add a new layer, and call it my light and shade layer. I pick a hard round brush, with opacity set to pressure (so when I press hard I get a dark line, but if I press softly I get a very light grey line). I use black as the colour, and I set the blend mode of the layer to Overlay. If you need a refresher – here’s a quick tutorial on blend modes in photoshop and gimp. I block in the basic shadow with a large round brush. Then I go back, with successively smaller brushes, to build up deeper shadows. Note that there’s shadows on the mountains that face the light too. Also – the deepest shadows are nearest to the crest of the mountain ridge. Don’t be afraid of hard edges here – shadows on mountains have very hard edges (unlike hills). Here’s a good example, but google images is full of great reference images for mountain shade. 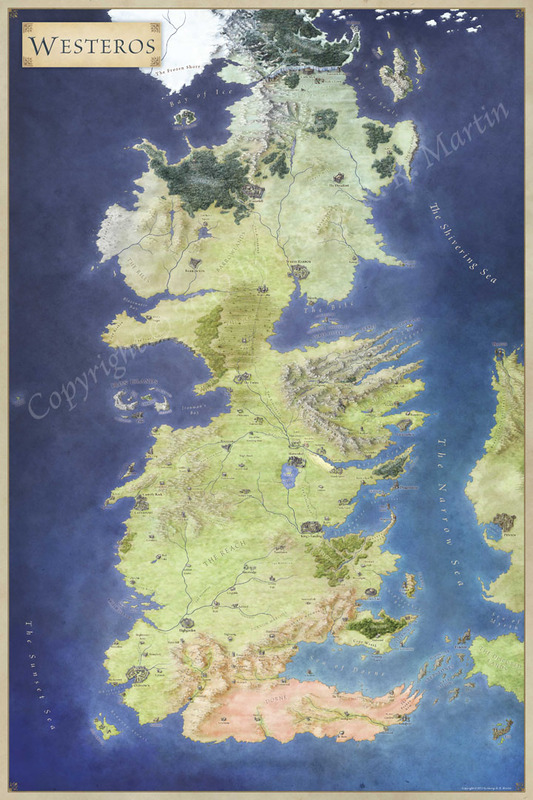 Our mountains still look a little flat, so I create a second overlay layer. Here I use a smaller brush with the same settings as before. I add more layers of shadow to the crevasses on the far side of the range. I also use a white brush to add highlights – both on the side facing the light, and along the crests in the shade. The sun will catch some peaks, edges and crests on the shaded side. This helps to pick out that detail, and avoids having just a boring black and white divide on either side of the range. Again, the lightest points will be along the crest of the mountain range. Our mountain range is looking good, but it’s very yellow. Create a new layer, and set the blend mode to colour. Pick a very desaturated blue (a bluey-grey). I use my pressure sensitive hard round brush with low opacity again. Build up layers of colour to pull the mountains back from that yellow colour above. I add some more saturated blue into the shadows to make it a little more interesting. And that’s it! Job done – we now have a fierce looking mountain range that can divide nations, hold dwarven tombs, or be the hunting ground of an infamous dragon. Beautiful, and so simple:) It’s amazing how some line and color can create a place you feel like you could actually climb and visit. Thanks for sharing this. Your mountain tutorials are awesome (actually all your tutorials are, and I think I picked up some much needed xp in both drawing and Gimp from them). Could you give some tips on drawing a plateau – a flat, elevated part of a mountain range, like the Norwegian Hardangervidda? That’s awesome – I’d never come across them before. I’ll definitely take a run at adding this.